The image below is a detail from a Corinthian Hydria, dated somewhere between 575 and 550 BCE. Walters Art Museum, Accession Number 48.2230. Off to our left, we see the charioteer of Achilles, Automedon (labeled ΑΥΤΟΜΕΔΟΝ in a right-to-left writing), standing on the platform of Achilles’ chariot. 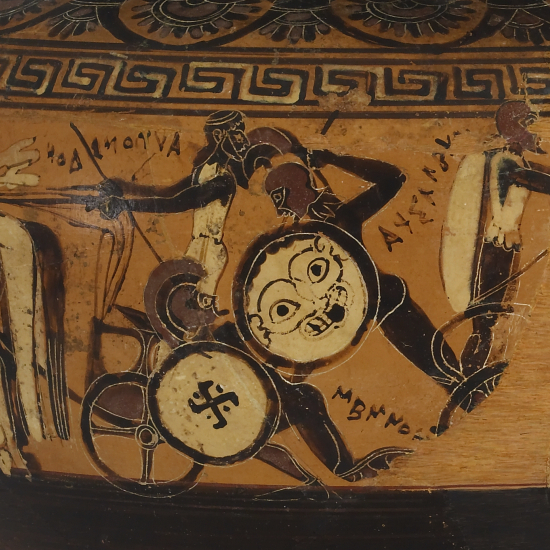 In the center, we see Achilles (labeled ΑΧΙΛΛΕΥΣ left to right) about to inflict a mortal blow upon his enemy Memnon (labeled ΜΕΜΝΟΝ left to right), using his spear. Contrast the scene below at Iliad 5.290–294, where Diomedes throws his spear from some distance and Pandaros is struck while still in his chariot. Off to our right, we see the charioteer of Memnon standing on the platform of Memnon’s chariot. He is facing away from the action. Further to our right, the paint has chipped away, but we can still see traces of the chariot rail and of the chariot wheel. The charioteer of Memnon has a shield slung on his back. In this posting for 2015.05.20, I experiment with different ways of making annotations in a commentary. The passage I have chosen for this commentary is Iliad 5.166–469. I will analyze these 300-odd Homeric verses in two different ways, viewing them through both the lower and the upper part of a bifocal lens. The word lens is my working metaphor here for the critical perspective I hope to achieve. Looking at this Homeric passage through the lower part of the bifocal lens, I will focus on the main story that is being told here. It is a micro-narrative about the hero Pandaros, who is fighting on the Trojan side of the Trojan War and who has just changed his medium of fighting. He has switched from martial archery to martial charioteering, and we are about to see how he gets killed in his attempt to succeed as a chariot fighter, that is, as an apobatic warrior. In a minute, I will review what I have already said about apobatic warfare in previous postings. Looking at this same passage also through the upper part of the bifocal lens, I will broaden the focus in order to get beyond the close-up of the micro-narrative about Pandaros and to open up the view in order to get a glimpse of the big picture to be seen in the macro-narrative. This macro-narrative is the story of the Trojan War as retold by the Homeric Iliad. 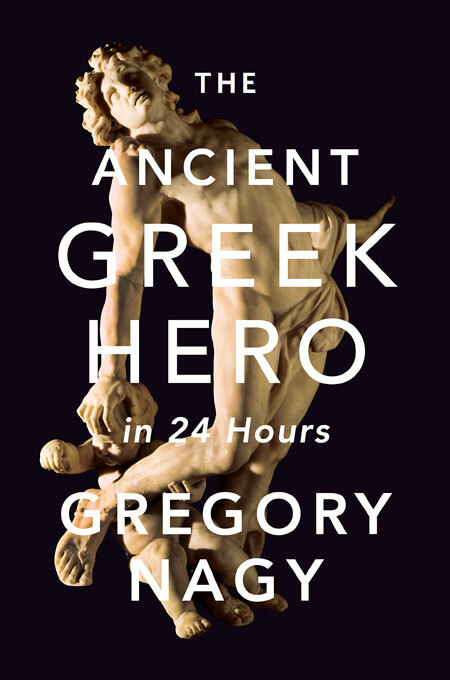 While commenting on the details of the micro-narrative about Pandaros as a failed apobatic warrior, I will also comment on details that relate to the macro-narrative of the Iliad itself. Some of these details relating to the macro-narrative will be irrelevant to the micronarrative, but other such details will in fact be quite relevant. To mark comments that are relevant not only short-range to the micro-narrative but also long-range to the macro-narrative, I will place two asterisks (**) before and after such comments. Comments that are thus marked will be bifocal, that is, they will reflect a double perspective that combines what is viewed through both the lower and the upper parts of my bifocal lens of analysis. To be contrasted are single-focus comments, which are not marked by asterisks. Since I need to cover 300-odd verses within the confines of a posting that requires extreme brevity, I will drastically modify here the format of my bifocal commentary. The overall content of Iliad 5.166–469 will be reported mostly by way of paraphrase. Each successive unit of content to be paraphrased is preceded by the number of the verse or verses containing the given unit. These paraphrases will have to serve here as a temporary substitute for my normal practice of prefacing each unit of content by quoting the relevant Greek text, which of course would indicate the details more fully and more accurately. Occasionally, however, I will still follow up on my paraphrases by quoting at least the most significant parts of the relevant Greek text. And here I must offer fair warning about the paraphrasings: the style I will use is often quite colloquial, especially in contexts where I attempt to recapture the subjectivity of the wording spoken by the characters involved in the story. The pararaphases and the occasional quotations will be followed by commentary. And, as already noted, I will place two asterisks (**) both before and after any comment that is relevant to both the micro-narrative and the macro-narrative. Before I begin my paraphrasing and commentary, I will first briefly review, as already promised, what I have already said about apobatic warfare in my previous postings, dated 2015.05.01, 2015.05.08, 2015.05.15. For the sake of brevity, I do not indicate relevant verse-numbers in the Iliad, though I do provide occasional cross-links to relevant comments in H24H. Case 1. Patroklos is the personal charioteer or hēniokhos of Achilles in the Iliad (23.280; see H24H 6§24). But we never get to see Patroklos actually driving the chariot of Achilles. Instead, a hero named Automedon drives this chariot for Patroklos when Patroklos replaces Achilles in the battle to save the Achaean ships from the fire of Hector (H24H 6§25). Patroklos rides to the battleground in the chariot of Achilles and proceeds to fight on foot as an apobatic warrior. It is in this context that Patroklos gets killed by Hector, who is the primary apobatic warrior on the Trojan side. The other charioteers of Achilles are Automedon and Alkimedon. When Patroklos is killed, Automedon asks Alkimedon to take his place as chariot driver while he, Automedon, goes off and fights on foot as an apobatic warrior (H24H 6§29). Case 2. Hector has many charioteers in the Iliad, and three of them are named: Eniopeus, Arkheptolemos, Kebriones. Each one of them is killed, “taking the hit” as drivers of the chariot for Hector, who fights on foot as an apobatic warrior. The Iliad also mentions other charioteers of Hector, without naming them. For Hector, charioteers are expendable. When Eniopeus is killed, he is immediately replaced by Arkheptolemos, and Hector makes no effort to protect his charioteer’s corpse; and when Arkheptolemos is killed, he in turn is immediately replaced by Kebriones, and again Hector makes no effort to protect his charioteer’s corpse. Only with the death of the charioteer Kebriones does Hector make an active effort, but even this effort is determined by his role as an apobatic warrior, since his mortal enemy Patroklos, in his own role as a rival apobatic warrior who is now about to fight Hector, makes an active effort to despoil the corpse of Kebriones. Case 3. Mērionēs is the chosen charioteer of Idomeneus, who is king of all the Cretans who fought at Troy. In the Iliad, however, we never get to see Mērionēs actually driving the chariot of Idomeneus. Instead, a hero named Koiranos drives this chariot, and it is Koiranos who “takes the hit” for the king. In the narrative that leads up to this battle scene, we learn that Mērionēs came to the battleground on foot, and he continues to fight on foot after ordering the king Idomeneus to drive away to safety from the scene of battle. Idomeneus had remained standing on his royal chariot after the charioteer Koiranos was killed. So, when Idomeneus is told by Mērionēs to drive away from the battleground, this king becomes the charioteer of his own chariot. In the Iliad, then, we never get to see Idomeneus actually leaping off his chariot and fighting as an apobatic warrior. Instead, the king is merely a chariot rider who is then transformed into a chariot driver. By contrast, as I have already noted, we never get to see Mērionēs actually driving the chariot of Idomeneus. And now I must add that we never even get to see Mērionēs actually riding in the chariot during this particular battle scene—even though he is fighting as an apobatic warrior. Mērionēs, then, is a Homeric example of a hero who could have performed as a chariot driver but chose instead the role of a chariot fighter. With this background in place, I now proceed to my commentary on Iliad 5.166–469. This passage, as we are about to see, features a micronarrative about another Homeric hero who, like Mērionēs, could have performed as a chariot driver but chose instead the role of a chariot fighter. This hero is Pandaros. 167 The Achaeans and the Trojans are battling, and the narrative is looking at the Trojan side of the battle. The hero Aeneas finds the hero Pandaros on the battlefield. 173 Pandaros is the best archer in Lycia. Pandaros has come to Troy from there. The Lycians are allies of the Trojans. 174 Aeneas calls on Pandaros to make use of his archery set by taking aim at the Achaean hero Diomedes and shooting him. 187 Pandaros says to Aeneas: But some god must be deflecting the arrows shot at Diomedes. 188–191 [Pandaros continues speaking to Aeneas:] I already tried shooting Diomedes to death and did not succeed. 192 [Pandaros continues speaking to Aeneas:] Too bad I don’t have a chariot here at Troy, since I would have jumped onto the platform of that chariot, ready to fight as an apobatic warrior. Here is the Greek wording: ἵπποι δ’ οὐ παρέασι καὶ ἅρματα τῶν κ’ ἐπιβαίην· ἅρματα τῶν κ’ ἐπιβαίην ‘I don’t have the horses and the chariot, with its platform on which I would be stepping’. Occasionally, as here, Homeric diction refers to a chariot by way of combining the nouns hippoi ‘horses’ and harmata ‘chariot’. More often, however, hippoi ‘horses’ can refer not only to the horses but also to the chariot pulled by the horses. Examples in the passage we are reading can be seen at verses 227, 249, 255, and in each case I quote the relevant Greek text. 193–194 [Pandaros continues speaking to Aeneas:] My father Lykaon has eleven chariots back home in Lycia. 195–199 [Pandaros continues speaking to Aeneas:] And each one of these chariots comes with two horses. 198–201 [Pandaros continues speaking to Aeneas:] My father had wanted me to go off to Troy with a chariot, but I said no. 201 [Pandaros continues speaking to Aeneas:] Damn, I wish I had come here with a chariot. 202–203 [Pandaros continues speaking to Aeneas:] I was being miserly about having to feed the horses. 204–205 [Pandaros continues speaking to Aeneas:] So I left the horses and the chariot behind, and I came here on foot. I wish I hadn’t. Hah, a lot of good my archery set did for me!!! Comment: Pandaros enters the battle on foot, just as Mērionēs at 17.612 enters the battle on foot (as I argue in the posting of 2015.05.08). 212–216 [Pandaros continues speaking to Aeneas:] If I succeed in ever having a safe homecoming, a nostos, damn if I won’t get rid of my archery set. It just doesn’t do me any good. 217–220 Aeneas says to Pandaros: Let’s the two of us get into my chariot and attack Diomedes that way. Comment: So, here we see a turning point in the action. Pandaros is about to be transformed in his role as fighter in the Trojan War. He will switch from an archer to an apobatic warrior. 221 [Aeneas continues speaking to Pandaros:] Come on, get into my chariot. 222–223 [Aeneas continues speaking to Pandaros:] You’ll see how maneuverable Trojan chariots are. 224–225 [Aeneas continues speaking to Pandaros:] The two of us can still make a getaway, escaping back to Troy, even if we lose the fight and Diomedes wins. Comment: As we will see from the action that follows, this assessment by Aeneas is mistaken. 226–227 [Aeneas continues speaking to Pandaros:] Here, you grab hold of the whip and the reins. 227 [Aeneas continues speaking to Pandaros:] While you hold the whip and the reins, I’ll be the apobatic warrior. Here is the Greek wording: ἐγὼ δ’ ἵππων ἀποβήσομαι ὄφρα μάχωμαι ‘I [= Aeneas] will leap off from the chariot in order to fight [on foot]’. Comment: The word ἀποβήσομαι here is one of the clearest Homeric references to apobatic chariot fighting. 228 [Aeneas continues speaking to Pandaros:] Or, if you prefer, you be the one who faces Diomedes in hand-to-hand combat on foot, while I drive the chariot: ἠὲ σὺ τόνδε δέδεξο, μελήσουσιν δ’ ἐμοὶ ἵπποι ‘or you [= Pandaros] be the one who faces this one [= Diomedes], while the horses-and-chariot will be my concern’. Comment: So we see a trade-off here. Who will be the driver of the chariot and who will be the apobatic warrior? 229–238 [Pandaros says back to Aeneas:] Let’s do it not the first way but the second way. These horses are used to you, not to me, and they will need to trust you if we are defeated by Diomedes and we need to make a getaway from him, driving back to Troy. Comment: We may compare the getaway of king Idomeneus in Iliad 17, who becomes his own chariot driver as he escapes from the battleground and makes it back to safety at the headquarters of the Achaeans. About the responsiveness of horses to a chariot driver who knows them well, I refer to Kirk 1990:84, commenting on Iliad 17.475–476, who notes what Automedon says about Patroklos: that the horses of Achilles especially heeded Patroklos as their chariot driver. 235–236 Pandaros continues speaking to Aeneas, worrying about the possibility that Diomedes will lunge at the two of them [= Pandaros and Aeneas] and kill both of them and then drive away the chariot horses [of Aeneas]. If you, Aeneas, are the driver, Pandaros says, this won’t happen, that is, Diomedes won’t be able to capture the chariot. Comment: but the irony is, that is exactly what will happen: Diomedes will capture the chariot and the horses. 237–238 So, Pandaros continues to Aeneas, you just drive the chariot and I will meet him head-on, using my spear. Comment: Pandaros is now ready for his new role as apobatic warrior. 239 Then the two of them, Aeneas and Pandaros, get on the chariot . . . ἐς ἅρματα ποικίλα βάντες ‘stepping onto the platform of the painted chariot’. Comment: The syntax of ἐς . . . βάντες reveals an explicit reference to apobatic charioteering. 240 . . . and they head for Diomedes, straight in his direction: ἐμμεμαῶτ’ ἐπὶ Τυδεΐδῃ ἔχον ὠκέας ἵππους ‘eagerly driving the swift chariot team straight toward [Diomedes] the son of Tydeus’. 241–250 Sthenelos, charioteer of Diomedes, spots from far away the menacing figures of Aeneas and Pandaros as they are rushing in their direction. Sthenelos recognizes both Aeneas and Pandaros, and he warns Diomedes to give way. 249 Sthenelos says to Diomedes: ἀλλ’ ἄγε δὴ χαζώμεθ’ ἐφ’ ἵππων ‘come on, let’s then give way as we ride off on the chariot’. Comment: The wording ἐφ’ ἵππων ‘on the chariot’ makes it explicit that Sthenelos the charioteer, while speaking, is standing on the platform of the chariot of Diomedes. As we will see in a minute, however, Diomedes is at the moment not standing with his charioteer on the platform of his own chariot. 250 Sthenelos continues, saying to Diomedes: There’s no point in being a show-off by fighting on foot in the front ranks now: you’ll get killed. 251–254 Diomedes rejects the advice of his charioteer Sthenelos, saying that he is not afraid of Aeneas and Pandaros. 255 And Diomedes goes on to say that he doesn’t want to get on the platform of his chariot: ὀκνείω δ’ ἵππων ἐπιβαινέμεν ‘I’m against the idea of stepping onto the chariot’. Comment: The syntax of ἵππων ἐπιβαινέμεν reveals an explicit reference to apobatic charioteering. 255–256 But Diomedes is definitely ready to face Aeneas and Pandaros by fighting on foot: ἀλλὰ καὶ αὔτως | ἀντίον εἶμ’ αὐτῶν ‘but in any case I am going to face them down’. Comment: the narrative is ostentatiously making the point that Diomedes prefers to fight on foot and not to escape the onrushing chariot team of Aeneas and Pandaros by riding off in his own chariot as driven by Sthenelos. 257–258 Diomedes continues talking to his charioteer Sthenelos: The horses that draw the chariot of Aeneas and Pandaros will not be taking *both* of them back to Troy, even if one of them succeeds in escaping me. 259–261 [Diomedes continues:] And if I succeed in killing *both* of them . . .
264 . . . and drive that chariot back to the camp of the Achaeans. 265–271 The story of the four horses. I skip here my paraphrase of this story. 268 Ἀγχίσης. Comment: Here we see the first mention of Anchises in the Iliad since the Catalogue, at 2.820. In my notes on this verse, published in A Homeric Commentary in Progress (2013.06.22), I propose that Ἀγχίσης is a conflation of ἀγχίθεος and ἰσόθεος. 272 Anchises gave two of these horses to Aeneas. 273 Diomedes continues speaking to Sthenelos: If we two can capture these horses that are drawing the chariot of Aeneas, we will get major kleos ‘glory’ in the epic tradition. 274–278 The confrontation begins. Pandaros calls out to Diomedes: Back then, I couldn’t succeed when I tried to kill you with my bow and arrows . . .
279 Now I will try my spear. Comment: Pandaros now leaves behind his role as an archer and speaks in the role of an apobatic warrior. 280–287 Pandaros now throws the spear, and it penetrates the shield of Diomedes. Pandaros exults, but Diomedes shouts back: this throw of yours failed. 288–289 Diomedes goes on to say: now I will kill at least one of you. 290 He throws his spear . . . Comment: Kirk 1990:89 points out that Diomedes is definitely on foot when he makes the throw; we may compare verses 9 and following in Iliad 5, where Diomedes is likewise on foot when he makes his throws at his human targets, who are there too riding on their chariots. I note the irony: Pandaros came to Troy as a fighter intending to fight on foot, as we saw at verses 204–205 above. 291 . . . and the spear hits Pandaros in the nostril. 291–293 The ghastly wound is described. 294 Pandaros falls out of the chariot. 295–296 The horses are spooked. 297 Aeneas now jumps out of the chariot, wearing a shield and with spear in hand: Αἰνείας δ’ ἀπόρουσε σὺν ἀσπίδι δουρί τε μακρῷ ‘Aeneas jumped off, carrying a shield and a long spear’. Comment: Aeneas now takes over the role of an apobatic fighter. 299–302 Aeneas stands over the corpse of Pandaros, protecting it with spear and shield. Comment: Similarly, as we see in Iliad 17, Hector will fight to protect the corpse of his charioteer Kebriones. Hector will be fighting Patroklos there, and both of them will be living up to their roles as apobatic warriors. 302–303 Now Diomedes grabs a rock . . .
303–304 . . . so big that even two people today could not lift it. 305–309 Diomedes throws the rock at Aeneas and hits him. 311–318 Aeneas would have been killed for sure, if it had not been for Aphrodite. She protectively holds on to his wounded body. 319–320 Meanwhile, Sthenelos the charioteer takes note and remembers the instructions of Diomedes. 325–327 and he hands it over to the hero Deipylos for safe keeping. 329–330 he drives back to the battlefield in order to rejoin Diomedes, who continues to fight on foot. 330–343 Now Diomedes lunges at Aphrodite, who is protectively holding on to the wounded Aeneas, and the mortal hero actually gets to inflict a wound on the immortal goddess. 343 Screaming with pain from the wound, Aphrodite lets go of Aeneas. 344–346 But Apollo picks up Aeneas. 347–431 The repercussions of the wounding of Aphrodite. 359–379 The goddess Aphrodite asks the god Ares to let her borrow his chariot, and she makes a getaway on that god’s chariot, traveling to Olympus. Her driver is Iris. Comment: So Aphrodite’s chariot getaway substitutes for the chariot getaway that did not happen for Aeneas. 432 Meanwhile, Diomedes lunges at Aeneas. 433–444 The god Apollo forces Diomedes to back off. 445–454 Apollo whisks Aeneas away. 449 Apollo makes an eidōlon ‘phantom image’ of Aeneas. 460 Apollo removes himself to Pergamon, after haranguing Ares to take over for him. 467–469 Ares, assuming the appearance of Akamas (462), harangues the Trojans to rescue the corpse of Aeneas, though we know that this corpse is just an eidōlon, as the story had already affirmed. Kirk, G. S., ed. 1985. The Iliad: A Commentary. Vol. 1, Books 1–4. Cambridge. Kirk, G. S., ed. 1990. The Iliad: A Commentary. Vol. 2, Books 5–8. Cambridge. Nagy, G. 2012. 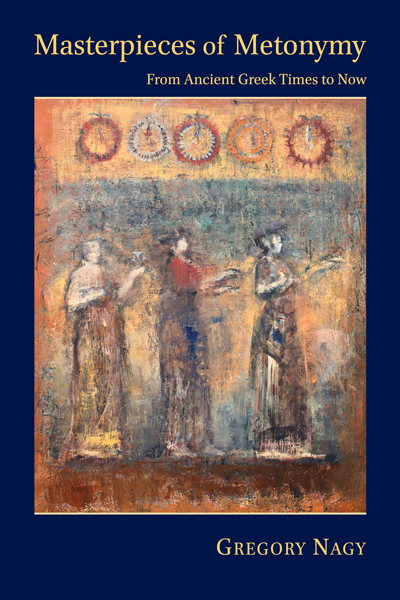 “Signs of Hero Cult in Homeric Poetry.” Homeric Contexts: Neoanalysis and the Interpretation of Homeric Poetry (ed. F. Montanari, A. Rengakos, and Ch. Tsagalis) 27–71. Trends in Classics Supplementary Volume 12. Berlin and Boston.